Kaiserliche Marine’s training yacht Comet (ex Meteor, ex Thistle) thundering down Kiel Fjord c1910. Inevitably, a 127 year-old challenge from Glasgow, Scotland to New York, USA for yachting’s Holy Grail, the America’s Cup, has left lingering family memories and mementoes. It was a big deal, as it would be now, and is still within a timescale where handed-down knowledge is informed by human interaction. For example, my father just knew his grandfather, who crewed aboard the G.L. 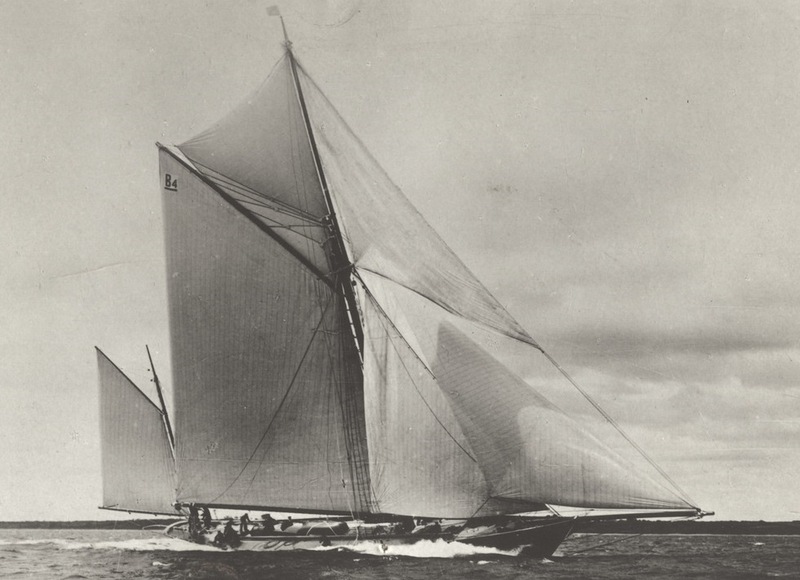 Watson-designed Royal Clyde Yacht Club challenger, Thistle, in the 1887 America’s Cup match. And I learned about it from my father. Sadly, nothing tangible survived; they were a family of thrower-outers. There will be other families who know that their forebear was one of Thistle’s crew: in the America’s Cup, around the Scottish, English and Irish coasts during the racing seasons of 1887 to 1890, or from 1891/92 when her name changed to Meteor under Kaiser Wilhelm II, or from 1895, when ownership was transferred to Kaiserliche Marine, the German Navy of that time, and she took the name, Comet. She was broken up in 1921. It would be wonderful to hear from them. Our earlier post about the Thistle and her crew has so far found three descendants with one new positive identification made. More on that to come, and look out for news at Thistle’s Twitter feed @Thistle1887. “Was but a muddle at the best”. 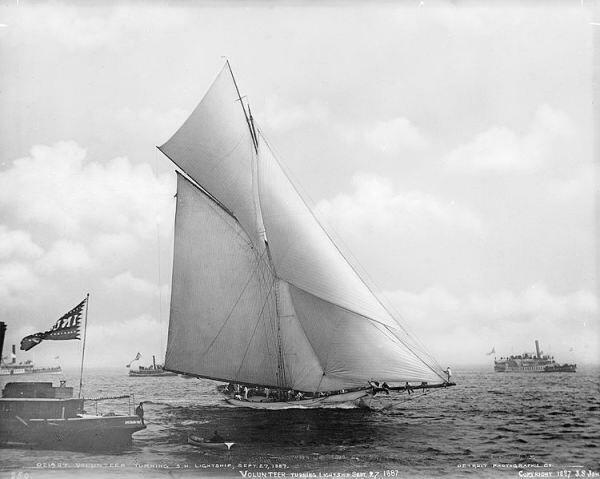 Thistle is nowhere to be seen, 21 minutes behind, as the American defender, Volunteer, rounds Sandy Hook Light Vessel during the first race, America’s Cup 1887. G.L. Watson designed four America’s Cup challengers. After Thistle’s failure in 1887, his learning curve steepened: Valkyrie II (1893) and Valkyrie III (1895) were very good boats, and Shamrock II (1901) was probably outdone only by the genius of Charlie Barr at the helm of the defender, Columbia. Ironically, Barr was one of Thistle’s crew in 1887 under his half-brother, John, and was born in Gourock on the Clyde. Martin Black’s beautifully illustrated biography, G.L. 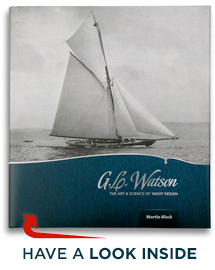 WATSON – THE ART AND SCIENCE OF YACHT DESIGN, takes a fresh look at these challenges, using primary sources to reveal that the British challengers more often than not snatched defeat from the jaws of victory. It can be ordered online here, or from the growing list of worldwide stockists here. This entry was posted in America's Cup, archives, Baltic Germany, Big Class, book, Captains, Clyde yachting, Clydebuilt, G.L. Watson, G.L. Watson clients, gift, Glasgow, Martin Black, object of desire, photography, yacht design, yacht designer, yacht racing, yachting history and tagged Clydebuilt, Comet, Duncan McArthur, Kaiser Wilhelm II, Kaiserliche Marine, Kiel, Kieler Fjord, Loch Fyne, Lochfyneside, Meteor, Strachur, Thistle, Volunteer, William Rhind. Bookmark the permalink.